A new mid-late season variety raised by the Scottish Crop Research Institute. With Malling Jewel and Lloyd. George among its parents, as is to he expected, the flavour is very good. The canes are moderate in growth, strong and upright, spine free and very easy to pick. 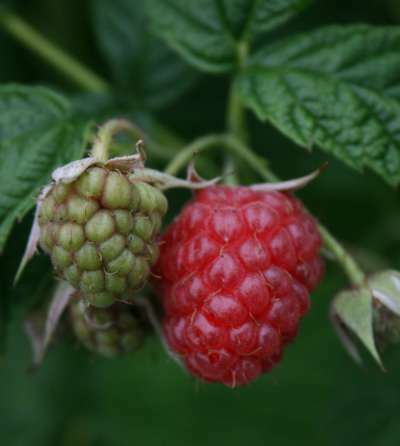 Medium red, firm berries that are excellent for dessert and exceptional for freezing. The crop is heavy. Excellent virus resistance including resistance to amphorophora Idaea, the main aphid vector of virus. With its heavy crop of flavourful fruits produced on smooth, compact canes, together with aphid resistance, Glen Prosen has become an exceptional new mid-season variety. Very highly recommended.